Isn't it strange-looking? 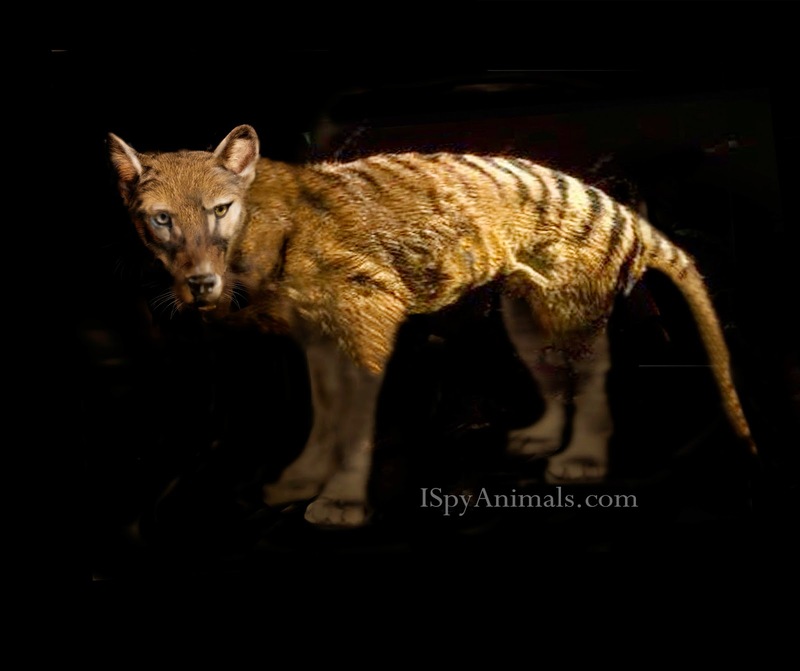 The Tasmanian Tiger was also known as the Tasmanian Wolf, or thylacine. It hunted wombats, wallabies, emus, and kangaroos. Since the thylacine was not a fast runner, it stalked its prey until the prey was exhausted. But when the dingo, Australia's wild dog, began to compete with the thylacine for food, the thylacine became rare in that land and flourished only in Tasmania, where there were no dingos. But trouble began...though there weren't any dingos in Tasmania, there were plenty of sheep. 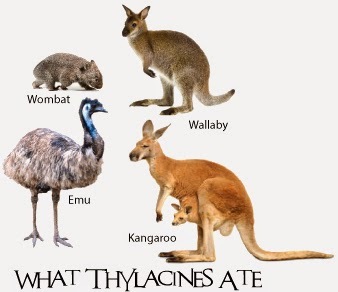 Sheep being easier to catch than kangaroos and wallabies, thylacines started killing and eating sheep and chickens. That didn't make the sheep farmers happy at all. Soon, there was a bounty of $100 for killing a thylacine, and people shot every thylacine they saw. In 1930, the very last wild thylacine was killed. 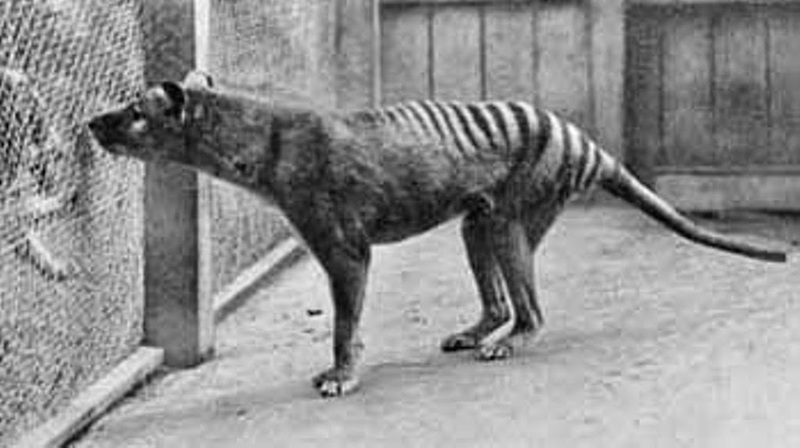 And 50 years later, no one has ever caught one or photographed one clearly, so the thylacine is considered extinct...no more of them exist. Tasmania doesn't seem abashed by their wholesale slaughter; the Coat of Arms for Tasmania still exhibits two thylacines holding a shield...how's that for irony? 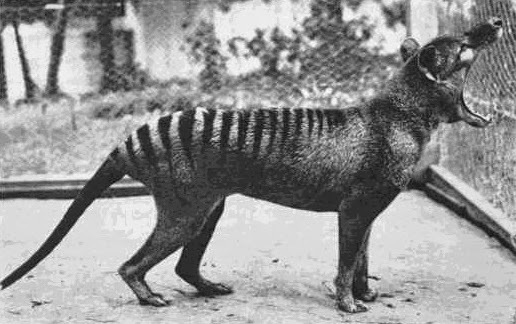 So the last thylacine in the wild was shot long ago. The last one in the zoo died, too. Long ago. But people still claim to see them in Tasmania; in fact, there have been 3,800 unofficial sightings since the last one died! Maybe they're still hiding somewhere in the wilds of Tasmania? There are attempts, even now, to CLONE the thylacine from preserved specimens. I haven't heard about this weirdiest tiger.Today first time I got to know about it via your blog.It seems really interesting having mix features ofwolf and kangaroo etc.